There comes a point in your putting when your stroke is good enough, and the reads you make are good enough, that you should be sinking putts. If you are not, check to see whether it’s because you don’t feel the ball falling into the hole before you start the stroke. I don’t mean visualizing the ball falling in, but feeling in your body the impact of the ball on the bottom of the cup liner. To avoid getting a sore back when you practice putting, use just one ball. That way, you have to get out of your crouch after every putt, to stand up and go get your ball. If you’re just missing makable putts, I’ll bet it has more to do with speed than line. If you can hit your putts from twenty feet in so they all roll at the same speed when they get to the hole, you have that much more clarity about how to pick the right line, and confidence that that line is the right one. I found my blade opened on the backswing, but wasn’t always closing. This made me miss putts to the right. I started hooding the putter, just a bit, on the way back to keep the blade square. It works. One of the questions surrounding putting is whether to charge to putt or let it die into the hole. The pros can die the putt at the hole because they play on greens that are flawless and true. Our greens aren’t that good, so we have to hit the ball a bit harder. A 40-handicapper and a scratch golfer have the same number of two-putt greens in a round of golf. Records bear this out. The scratch golfer, though, will have three fewer three-putt greens and three more one-putt greens. A word to the wise: It is much easier to learn how to putt like a scratch golfer than to swing like one. I would much rather leave a 20-foot putt dead on line and two inches short than burn the edge of the hole and leave it four feet past. Ben Crenshaw once said that for him, any putt outside eight feet is a speed putt. I think it’s important on the green that once you have found the starting line and feel the speed, you stand over the ball and forget about the hole completely. Just hit a straight putt the same as you do on your living room carpet. Thinking that there is more to do than that this point is a major reason why you miss putts you should be making. The reason you rarely miss a three-foot putt on the practice green is that you don’t care if it goes in or not. The reason you miss them when you play is that you do. There is a definite order of skills to develop to be able to break 80 on a semi-regular basis. First, get the ball up to the green in a hurry. Learn to hit fairways and get the ball on the green or close to it with your irons. Short game and putting are no help if you waste strokes getting to the green. It should take you no more than 38 strokes per round to get the ball hole-high in regulation. Next, learn to chip. I know, you might think putting should be next. But if your average leave with your chip shots is about six feet, you won’t get many up-and-downs. There need to be a few stone cold tap-ins every round, and a chip-in every other round or so. Still no putting, not yet. It’s pitching. Learn to get the ball on the green in one shot from under 100 yards. You might be surprised, if you keep track, at how often you don’t do this if you’re a 15 or higher. Finally, putting, specifically approach putting. Three-putt greens are caused most often by leaving your approach putt short. So practice approach putting a lot. From forty feet in should be two-putt territory. The other critical putts are the 3- and 4-footers. Inside that, you’re 90 percent. Outside that to six feet, you’re fifty percent. But those mid-range shorties are the key to closing the deal on the green. – Drive 235 yards, in the fairway. – Hit the green from 150 yards in. – Chip to under three feet. – Approach putts to under two feet. – Ninety percent within four feet. – Par all the par 5s. – Par two of the par 3s. – Par five of the par 4s. That gives you a 79. You still have to do some playing, but if you look at it that way, it isn’t so hard. Get this: you’re playing great. Your swing is clicking, the putts are dropping, you’re chipping it close. Good golf is automatic. Then you get an idea that you think will help you play even better. You try it out, and presto! There goes that good patch of golf. When something is working in your golf game, working real well, leave it alone. Do not try a little thing that will make it even better. You’re on top of the mountain. A change will only take you downhill. LEAVE IT A-L-O-N-E. Remember Padraig Harrington? Three major championships in two years? What is there for him to do next but start tinkering with his swing to get even better. That third major, in 2008, is the last time he has won. Zip for five years since then. Or consider Ian Baker-Finch. The Australian with a working-man’s swing won a few times, then struck gold on the weekend of the 1991 Open Championship and won. Thinking he should be able to contend in every major he entered, instead of merely enjoying his moment, he tried for more distance and ruined his sweet swing. He was off the Tour in a few years and now a single-digit handicapper could give him a run for his money. Remember that the goal of golf is to get the ball in the hole in as few strokes as possible. If you’re doing that, keep doing what you’re doing to do that. Work it for all it’s worth until it stops rewarding you. Then you might try something new. But as long as you’re finding fairways and greens, putting it close or in, you’ve arrived at the goal you have been seeking. Let development go. Play with what you have learned how to do. Hit the same shots over and over again. Enjoy your success. I think the reason why so many of us keep changing is that is what we’ve always done. Golf is a process of looking for a better way. That’s what we expect from the game. Now you have got to where you wanted to go, you can’t keep looking at golf as a process of change. Look at it now as a process of performance. Your goal is not to seek, but to repeat. Really now, isn’t that what you do in other things of your life that you are accomplished at? You use the same skills over and over again. There’s enjoyment in that. 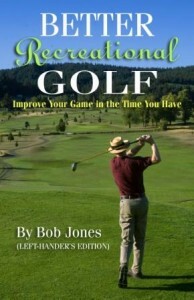 Make your enjoyment in golf hitting one good shot after another, with the same skills. If you’re in that place, it’s because you have sown, and sown, and sown. Now it’s time to reap, reap, reap. 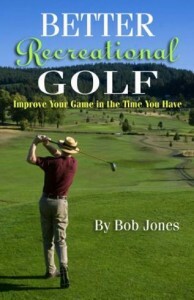 There’s so much to practice in golf, and you need to do all of it at some time or another. But try this concentrated practice routine and see if it doesn’t pay off real soon in lower scores. 1. Hit range balls only with your driver and sand wedge. Go through your bucket in a six-shot pattern: hit five wedges, then one driver. That will tighten up your short game, and bring a controlled swing to a club that you just have to hit well to have a chance to score. 2. Go to the practice green, with one ball, and chip up to a hole and putt it out. Do this thirty times, hitting to a different setup every time. Maybe you don’t chip with a sand wedge all the time, but that’s OK. You’ll learn to get the ball close enough. You’ll learn to putt by making real putts: the back end of an up and down, which is golf’s major scoring skill. I know there are a lot of shots and clubs this scheme doesn’t address, but it does address the important ones. The skills you learn here will carry over into the rest of it, believe me. Traditional golf statistics, such as fairways hit, greens in regulation (GIR), and number of putts, only exist because they’re easy to collect. They don’t tell you what you need to know about the state of your game. These four stats do. Get a second scorecard and record them on that one, for each hole. 1. Distance to the hole, in yards (DTH). This is the vertical distance to the hole after the regulation number of strokes (par minus 2) have been taken. DTH is measured from the ball to a line drawn through the hole at a right angle to the fairway leading up to it. If your ball is on this line or beyond it, put down a zero. You can have a positive DTH even if the ball is on the green. A good way to lower your score is to get the ball hole-high as soon as you can. 2. Number of short shots (SS). Any shot into the green that is less than a full swing goes here. If you want to, you can write down the length of the shot (distance to the edge of the green along the line of the shot) to remind you what kind of shot it was. Clearly, you want only one SS per hole if that. 3. Length of your first putt, in feet (LFP). Circle it if you sink it. LFP is a way of evaluating your long game (if SS is zero) or your short game, if SS is 1. 4. Length of your second putt, in feet (LSP). Circle it if you sink it. An uncircled number indicates a three-putt green. LSP is a way of evaluating both your approach putting (value of LSP relative to value of LFP), and your short putting (by the value of the circled or uncircled LSP numbers). 5. Mental errors. These errors cost you extra strokes for no reason. 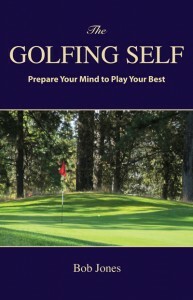 Examples are not being confident while hitting the shot, quitting on the shot (common in the short game), thinking too much about results, and so forth. Mental errors are not random. If you keep track of them, you will find a pattern of them occurring with particular shots, or at similar points in the round. Knowing that, you can take the proper corrective action. Put a check mark in one of the four boxes above to indicate a mental error on that shot. You’ll remember what it was. If you’re a beginning golfer, keep track of these two numbers only: number of fairways hit, and number of three-putt greens. These entry-level indicators show you how well you’re doing at learning golf’s two fundamental skills, the swing and putting. In an earlier video, I showed you a drill to teach yourself how to have your hands leading the clubhead as it comes into the ball. Now I’m going to show you how to install that technique into your shot-making, one club at a time — the right way to install any major swing change. If you’re not getting a ball first-ground second contact this technique should produce, you are likely playing the ball too far forward. Gradually move the ball back in your stance until you get it right. Practice is not play. By that, I mean it’s not playtime, where you can knock around some golf balls and call it good. It’s serious business, if you want to improve. A few days ago, I took my grandson to the range to practice his short game and putting. This is the phase of the game were he’s losing too many strokes, and can get them back the most easily. I gave him a challenge: get a twenty-yard chip up and down, and not quit until he did it. He had four golf balls that he hit with his 6-iron. Two of them ended up way out of one-putt range, but two gave him makable putts. He missed them both, so back to the start. Four more chips. Just get one of them up and down. Well, this was taking longer than I thought it would. After four rounds of this exercises, with no luck, I just stood out here and tossed the ball back to him if it ended up too far away. Finally, he got one to five feet. I helped him read the putt and line it up. He missed. Back to chipping, and he was getting pretty discouraged. About six chips later, he hit one to four feet. OK, I thought, this is it. He missed. Back to chipping. We had to be getting to the 40th chip by now, and I was wondering how long this was going to take. He was getting pretty discouraged. I stayed calm, though, and told him that if we quit, we would have walked away and learned nothing. So here we go again. The next chip he hit was running a little too fast, but had a really nice line, and it went in. We’re done. If the up goes in and you don’t need the down, that’s OK, too. He was so happy. But one thing he was so happy about is that he had stuck with it (with some help) and met his goal. Anyone can quit. He left the range with a feeling of achievement rather than failure. That’s serious business. I’m a good chipper. My exercise is more demanding. I chip four balls to one hole and don’t quit until I get all of them up and down. Then I hit four balls to four different holes and don’t quit until I get all of them up and down, too. Sometimes I get both parts right away, so I start over with more difficult chips. I make myself work for success. You won’t get good on the course until you make yourself be good in practice. That’s my habit, that’s a habit I’m teaching my grandson, and I hope this post inspires you in that regard if you’re not doing that already.